A Citi Bike docking station has arrived on the northwest corner of Avenue A and Second Street... as far as I know this is new within the last few days... can any Citi Biker confirm this arrival? Does that mean the unmistakable scent of urine on that corner will no longer be??? If this is permanent it's a terrible place for a docking station. Placing it on the sidewalk takes up pedestrian space and you will have the bikes being ridden up and down the sidewalk as bikers come and go. We need more sidewalk space for pedestrians, not less. Anon 8:54am, you need to try a little harder. That sidewalk is very wide; plenty of space for a bikeshare station. Although I do agree that it would be more fair to take out some free car parking and instead put the bikes there; they seem to be much more used than the many cars in our neighborhood, often registered out of state, that barely move save for alternate side parking. This station seems to replace the one recently removed from the SW corner of 1st Ave & 3rd St. Looking at the Citibike map, that station is no more, but the one on Ave A & 2nd is listed as active. So just a minor move in the neighborhood. They installed these Tuesday morning, the 16th. Huzzah! 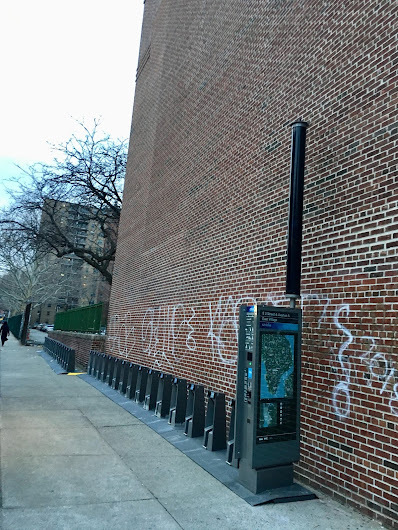 It's needed -- the docking stations around Tompkins are bare in the morning and full in the evening, and they just pulled out the one on 3rd Street at 1st Ave.
Wow. Lots of people seem to choose that spot in the corner by the fence to sleep/pass out. I’m not sure I understand how this makes me feel. I feel horrible for them and I often avoid walking by for the helpless feeling and the awful stench. It’s tough. So many folks need help and there’s only so much I know to do. During the cold spell we just had, I gave a man a pair of gloves because his hands were cold and he obviously didn’t have any money. He was touched and thanked me loud enough for the man nearby who was asking for money to hear. He, in turn, made a scene out of the fact that I hadn’t chosen to help him instead and I immediately felt bad. I’m fortunate, I know, but it still breaks my heart daily and fortunate people shouldn’t be wearing blinders to hide the ugliness around them.